A middle-aged man rode up to me in the supermarket carpark on a bicycle and asked for money to help feed his six- year-old boy. He said he hadn’t completed his benefit paperwork on time – and his payment had been halved for six weeks, right on Christmas. He sped off with the $6 I had in cash to buy his son dinner, or so he said. While the Government seems satisfied to have a plan to halve child poverty in 10 years a majority of New Zealanders want it eliminated in just over four. The Child Poverty Monitoring group, including the Commissioner for Children, says “to move children out of poverty, New Zealand will need to boldly address systemic issues”. While the Government is creating a law requiring it to set child poverty targets and produce a child poverty reduction strategy, the monitoring group says the number of children suffering material hardship in poverty-stricken households is staying about the same. 70,000 were in material hardship, going without 9 or more things they need. The latest Child Poverty Monitor report says more than 160,000 children are living in households without enough food or healthy food. The Government aims to cut the number of children in poverty by 50,000 in its first term (by 2020) and by another 50,000 by the end of its second term (2023), if it is re-elected: a total of 100,000. According to Cabinet papers, its 10-year target is to reduce the proportion of children in material hardship from between 13% and 15% now to 7%. Do New Zealanders think this is good enough? Are there ways to help make a major dent in the suffering and lost opportunities we are visiting on our children? Will voters for all parties back a big fix? Are we in danger of blowing an opportunity to “boldly address systemic issues”? Let’s hope not. As a public service project, Horizon Research has polled New Zealanders four times between May 2017 and August 2018 on their attitudes to poverty – and potential policy fixes. The results have been gifted to decision makers. One possible answer is a basic income for children. From 1946 until 1991 New Zealand had one called the “Family Benefit”, a universal unconditional payment for every child up to age 16. In the 2017 Budget the Government partially re-introduced it with a $60 a week payment for all children during the first year of life, called “Best Start”. The payment can continue up to age 3, with income testing. Paying a basic income of $60 a week for every child up to age 17 would cost about $3.8 billion a year. That equates to about 1% of gross domestic product and compares with a total annual tax of $84 billion a year in the Government’s 2017 Budget. 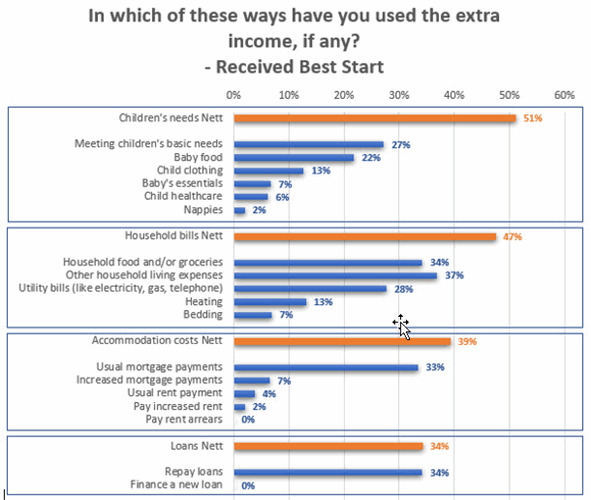 Horizon provided this information and asked New Zealanders if, in general, they would support or oppose a basic income payment of $60 a week being extended to all 1.22 million children living in New Zealand, from ages 0 up to 17? 55% said “yes”, 20% “no”, 19% were neutral and 8% were not sure. Support is widespread: 62% of those in the households with incomes of more than $200,000 a year support it (only 26% of this group oppose). The annual household income in NZ at June 30, 2017, was $100,103; personal income $49,475. 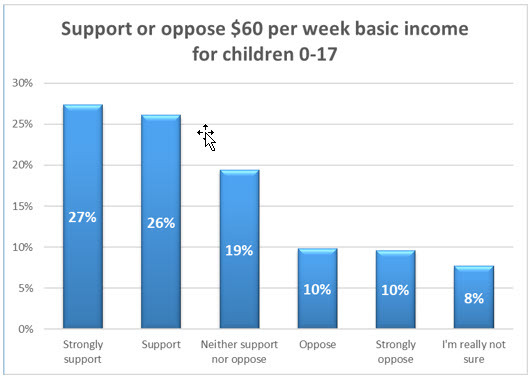 Among voters for the Labour, Green, NZ First and National parties at the 2017 general election, more support than oppose a basic income for children. NZ First (which has a Minister for Children) 46% support/ 24% oppose (with 27% neutral). The door appears open politically for a basic income of $60 per week for every child. Which parties will walk through it for our children’s sake, if not their own? Canada did in 2016, introducing the tax-free Canada Child Benefit (CCB) to help families meet the cost of raising children. This year the maximum annual benefit is $6,496 per child under 6 years and $5,481 per child aged 6 to 17. Horizon finds 38% of adults think income in-equality is a serious and widespread problem (just 6% say it isn’t), 39% think a basic income will reduce the broad and negative impact of poverty and 39% think it will make families more stable. Will a payment like this be “wasted”? So, recipients were effectively targeting the use of a universal payment. New Zealanders are impatient for action. Rather than ask only about the proposed reduction rate in child poverty, Horizon asked when it should be “eliminated”. Overall, the average preferred time to eliminate it is 4.4 years. Green and Labour voters want 3.8 and 3.7 years respectively. Voters for all parties in Parliament want it dealt with in 5.3 years or sooner. Therein lies a major opportunity to “boldly address systemic issues”. You are welcome to comment on this at our Facebook page. Stuff and some of its related newspapers, including the Dominion Post, have published this article. More than 480 comments have been left online. To contact Graeme Colman please e-mail gcolman@horizonresearch.co.nz, or telephone +64 21 848 576. To join Horizon's research panels and have your say, you're welcome to sign up here.